Burnham and Poulter trade NHS statistics Jump to media player Health Minister Dan Poulter and shadow health secretary Andy Burnham on English NHS services and the quality of care. Skinner on NHS: Get it done, or get out Jump to media player Dennis Skinner tells the Commons that nurses have lost a "considerable amount" in real pay and A&E departments are "bursting at the seams". Landale and MPs review PMQs Jump to media player James Landale and Andrew Neil review the PMQs clashes with Labour's Chris Leslie and former Tory leader Lord Howard. NHS England 'faces £2bn funding gap' Jump to media player NHS England faces a funding gap of up to £2bn in its budget for the next financial year, health chiefs tell BBC News. NHS 'facing £2.5bn funding gap' Jump to media player The NHS in Wales faces a £2.5bn funding gap in the next 10 years, according to new research. 'England can learn from Wales' Jump to media player The Labour Party in Wales can teach its counterparts in England about its handling of public services, the party's leader says. BMA warns on GP waiting times Jump to media player Patients will have to wait longer for GP appointments because of increasing demand and a falling NHS budget, according to the British Medical Association. £18m heart unit for Lister Hospital Jump to media player A new acute cardiac unit for the NHS in Hertfordshire, costing more than £18m, prepares to open its doors to patients. Cardiac implant 'could cut deaths' Jump to media player More patients in London will now be able to access life-saving heart devices on the NHS following new health guidelines. Competing claims were made by David Cameron and Ed Miliband at PMQs on waiting times and metrics of the NHS in England and Wales. 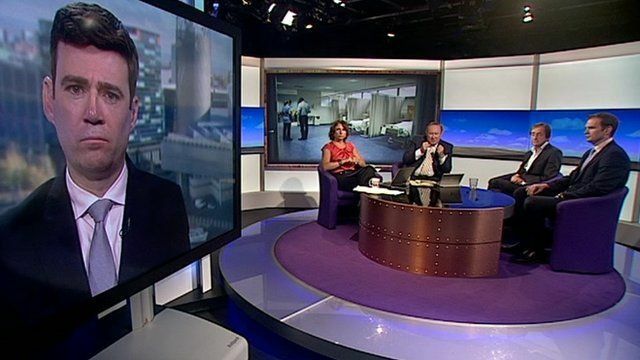 Health Minister Dan Poulter and shadow health secretary Andy Burnham traded further statistics on English health services, and the quality of care, when they spoke to Andrew Neil on the Daily Politics.